Itchmo Forums for Cats & Dogs > Pet Behavior > Cat Behavior & Training > Has anyone seen this? The shelter took Ellie and Jethro back a year ago. 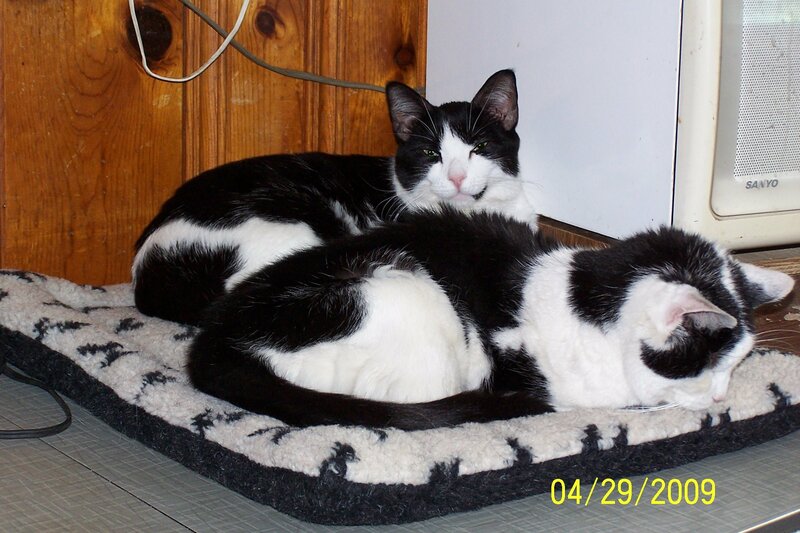 They were siblings (real ones - littermates) adopted out from the shelter and returned due to illness. We found out it was recalled food. Jethro died and Ellie survived. To make a long story short, Jethro was cremated and his possessions were put away. I took in Ellie and am still caring for her. I brought home Jethro's bed last night and all Ellie did was stand on it and cry. The shelter thought she should have it because it was her brother. BIG MISTAKE! She remembered and she grieves. It was her brother. Damn, do I feel stupid. That is amazing that Ellie remembers Jethro's scent after 1 year. I believe in spiritual connections of beings on another level. Maybe Jethro's spirit is still there. I am trying to connect with a beloved kitty that had passed, but have been unsuccessful so far. Maybe if we open our minds, we can connect with our lost ones. I had no idea animals could grieve that long. Justme, she is howling and crying. I think it's grief because she has never acted this way before. My sad little cat makes me sad. Arlo- I don't know if you should take it away from her. Might be worse now that she has smelled him on it. See if she settles down in a few days.She may take comfort in being near his smell after the first upset passes. Our neighbor gave each of our dogs a toy that had belonged to her dog after she died, & at first they would just sniff them & whine & look around for Corey. After a while though they would play with them for a few mins & then cuddle with them.I think it gave them comfort. Poor little Ellie - this is heartbreaking! She is expecting him to show up now that she can smell him. I agree with lesliek - maybe try to keep the bed out for her. After her initial expection of thinking he's around passes, she may get some real comfort in being around his scent & sleeping in his bed. Maybe when she is in his bed you can try to 'commune' with her to help her understand. Who knows, maybe he is there too & she feels his presence. Arlo, I am so sorry to hear that poor little Ellie is so sad. In my house, now 2 months after Gizmo died, Rufus is still grieving. I did not pick up and take away Gizmo's bed. Rufus would also cry when he was in it. Now he goes to Giz's bed when he is frightened of something. When he goes in the bed, he settles almost immediately and begins to purr his head off. What I also did was to take a small wash cloth, rub it all over Rufus' cheeks and put that cloth into Gizmo's bed. Now Rufus no longer cries when he's in there, he just settles down and has a good, happy snooze. Gizmo and Rufus were not even sibblings. Sorry to hear about the problems with Ellie, but they do remember. Weird story, one of our dogs (Buck) didn't get along with another of the males, that one died about 5 years ago, and if Buck saw a picture of that dog even years later, and this is just a picture, he would growl, snarl, and get really nasty, weird isn't it. That is so sad about Ellie! I do agree that letting her keep the bed is the best thing . I think that she may have a rough few days, but based on my experience, it may resolve after that, especially if you follow Peg's suggestions. They do remember scents for a long time. Phantom had a litter of 3 kittens (was pregnant when I took her in.) The kittens went to their own homes at the age of 13 weeks. A couple of years later, I happened to ride in the car of the co-worker to whom I had given one of the kittens. When I came home, Phantom smelled me and began making kitten-calling sounds. The smell had transferred from my friend's coat to her car seat to me, and Phantom had recognized the smell of her daughter on me! I'll be keeping Ellie in my thoughts. Thank you, all of you. Ellie is a great cat. She is wrapped up in his bed now. I'm going to leave her alone with it. I'm amazed Ellie still remembers. Wow. But I agree with what everyone else has said - give her time. As humans we feel devastated when we lose a loved one, but it gets easier over time; I imagine it might be the same for pets. Plus, maybe she was too sick to grieve when Jethro died and now she's finally getting the chance. Sorry to hear little Ellie was so sad, Arlo. I hope she feels better soon. This has made me think about something. Several years ago we found a feral cat with kittens and found homes for the kittens; my father-in-law kept one. My mother took in the feral cat, who is now tame with all of us. Since we always had contact with her kitten, I wonder if that familiar scent that we carried helped her warm up to us. That Ellie remembered the smell makes perfect sense, when I think about it for a bit. I'm sure many of us have had the experience of a smell suddenly evoking a vivid memory of a person or event from decades earlier. I've read some articles that say there are strong neurological connections between the olfactory (smell) centers and memory centers in the brain. Cats' brains are not that different from ours, and they are much more tuned in to smell than we are. I hope that Ellie is feeling more comforted today. It might be that Ellie finally realized what happened to Jethro from the smell of the bed, so she is completing the grieving process. Let us know how she does. This makes sense to me. I'm sorry to hear that Ellie is so sad but I think if you give her a few days the bed may comfort her as others have pointed out. Now Ellie will not let me (or anyone) touch HER bed. She chased HoJo off it a little while ago. I was going to move it to the bedroom, and she got quite irate! So I'm thinking she's finding comfort in it. oh how sad, but how smart are kitties.....................amazing.